Article in print and distribution format, pdf 1Mb. Earned Value Analysis is the only project management tool that can objectively status cost and schedule performance in real time. EVA creates a dollars in time paradigm where a business earns revenue and profit from intellectual labour. EVA is a small and easy to use project management model, replacing traditional time based activity bar dependent-milestone-deliverables model. EVA also creates project at a glance easily understood visual display of quantitative information in graphical or textual format. EVA is primarily a schedule tracking tool comparing the calculated value of work performed (what you have earned) to the actual cost (what you have spent) and to a projected cost (your budget) of work performed. Differentials are expressed as cost, time, progress, per cent complete, or a performance index. A fundamental concept to understand EVA is tracking dollars in time is more simple and objective than traditional project management model as it unlinks tracking subjective assessment of technical deliverables from tracking the objective cost of the time to perform the work. EVA is exactly the cliché time is money in objective practice. EVA comes from engineering procurement construction management and contract administration companies, and design-manufacturers such as aerospace companies. These projects are large, multi discipline and location and subject to schedule performance bonus or penalty or consequential damage clauses. On some of these projects invoicing is by EVA calculation: that takes a real commitment! There is no benefit for a design consultancy to learn every client’s different project management methods and tools, its often unbillable time with no other application. Traditional project management tracking tools are custom or unique implementations at each client. Generally they link personnel and tasks in a time based activity bar dependent-milestone-deliverables model, the design consultant’s activities often are only a single line. By default they have no link to cost performance which is acceptable only when labour doesn’t earn revenue or profit. EVA will give you ability to control your project, report your own status instead of sending data to your client to integrate and assess your performance; own your project and lead your client in managing it. A costed Work Breakdown Structure includes actual dollar amounts with each of the work activities. Each activity should not exceed 30% of the total budget, a risk management strategy to spread costs evenly. Every client’s WBS is different; all include work activities, time to perform them, or personnel. EVA only requires costs. Establish a timeline including regular reporting periods of costs spread over calendar duration of your project, similar to traditional project tracking time based activity bars. EVA’s metrics of actual costs, % complete and earned value will all a matching timeline. Estimate of how you will burn labour during the project. It will set the timeline duration, when graphed it’s often an S shaped line (project starts slow with few personnel, ramps up to full labour burn rate, then ramps down with delivery). A projected cost timeline is optional, a unique and time saving feature of EVA, discussed below Table 2. Cost billable to the client during a regular reporting period. From employee time sheets, MIS or accounting system, or manual entry, you must have this data and it must include real billable costs. One week reporting period is best, longer period can mask early problem identification especially on large projects. An internal project where labour does not earn revenue and profit can enter labour burn rates. Some companies do not make available actual labour cost figures. This practice is incompatible with project management in general and EVA specifically. There is no alternative. The project manager should determine each WBS task % complete from discussions with team members actually doing the work to maximize objective assessment of work performance, how you determine it is up to you. Section 4 “Earned value timeline” has an in depth discussion. EVA only tracks costs, not deliverables. 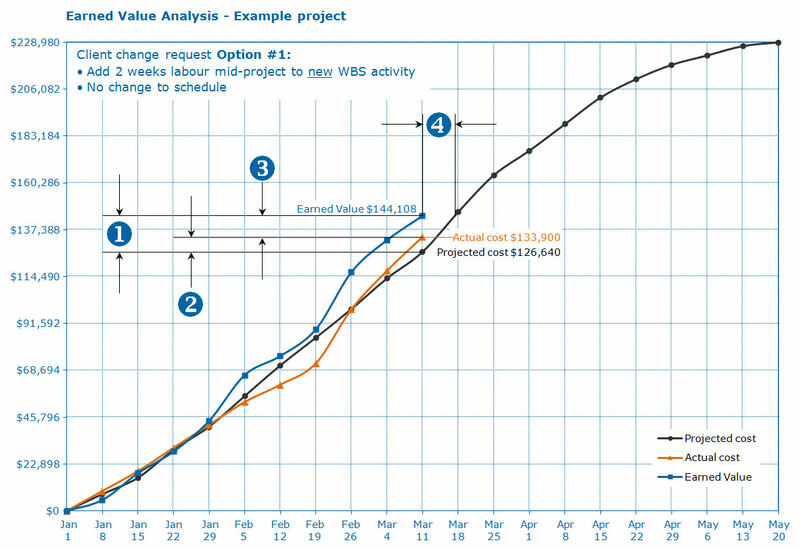 EVA can still report deliverables schedule by calculating project status as cost or time. Unlinking tracking subjective deliverables from the cost to do the work gives a math data basis. EVA assumes cost and time have the same units and can be equitably compared, satisfying the cliché time is money. What does EVA look like? The example project discussed in Tables 1 – 6 is a simple labour only model typical of a design consultancy, setup on separate linked spreadsheets. Any WBS list of work activities and tasks, deliverables, or personnel with time or cost is acceptable, their type, name, description, or grouping is up to you. Budget WBS costs per Nomenclature #1 above. Table 2 shows Projected cost timeline. Actual cost per Nomenclature #4 above. Table 3 shows Actual cost timeline. Earned value calculated per formula above. Table 4 shows Earned value timeline. “Status” compares Earned value to Actual cost, it could calculate anything of interest including cost or time differential, cost or time to complete; section 6 “Problem identification” includes examples. Highlighted value is discussed in Table 6 Problem identification. 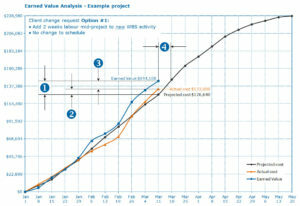 Estimating entire project progress is similar to traditional project management time based activity bars. This is difficult and time consuming but important to assess most likely actual project progress. However, for EVA this is optional! If Table 1 textual display of quantitative information is good enough then projecting costs over an entire timeline is not required. EVA really can work with this limited data, however, a Projected cost timeline is required to create Table 5 visual display of quantitative information 3-line graph. 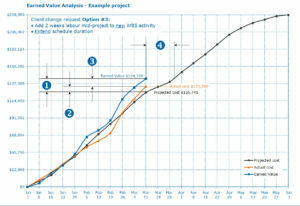 A common timeline is still required for Actual cost and Earned value % completes. 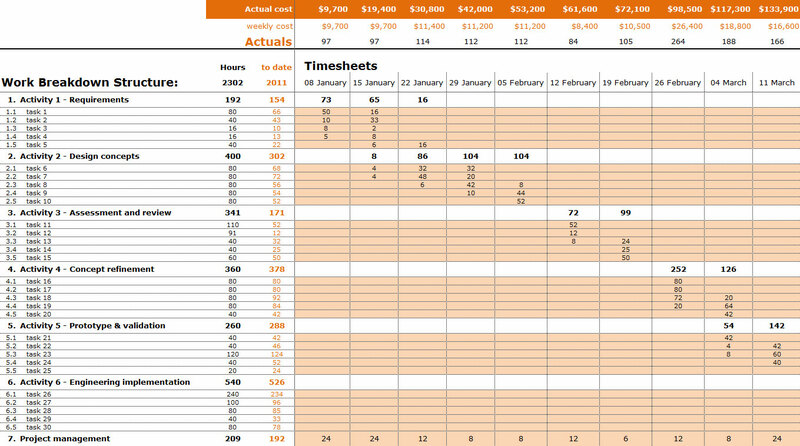 Table 3 shows summed up employee time sheet hours used to calculate weekly and accumulative Actual cost. 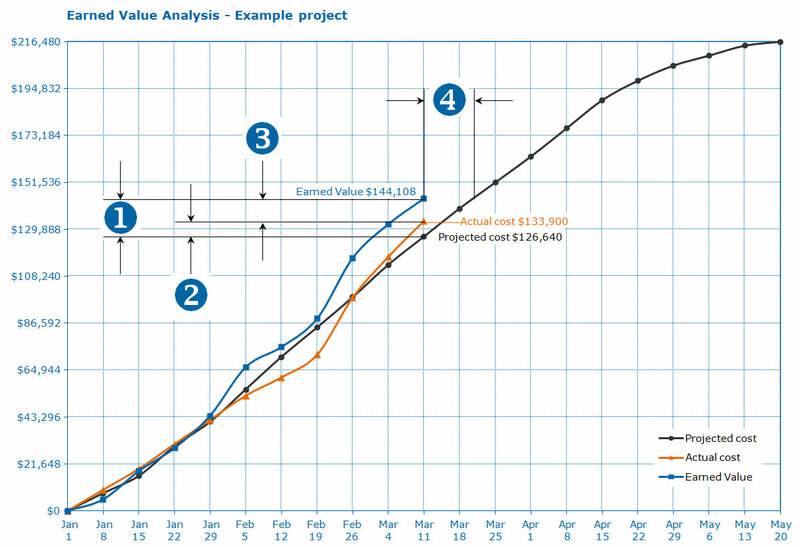 The project manager enters Actual cost data per Nomenclature #4 above for the current reporting period, in this example’s light orange fields. Table 4 is an extended Table 1 textual display of quantitative information with an arbitrary mid-project cut off for analysis. The project manager manually enters % completes for the current reporting period, in this example’s light blue fields, after discussions with team members as described above in Nomenclature #5. This is the only manual data entry that can’t be derived from other sources depending on the application your company uses to collect cost and time data. • % Complete of what? We can understand % complete assessment by breaking activities down to finite work tasks with a logical beginning and end deliverable: a user analysis, a set number of design concept sketches, or a 3D form model. This helps define the WBS task description, time, and cost. A traditional personnel time based activity bar dependent-milestone-deliverables model does result in an ambiguous “Donald is at 40% complete”. Table 4 shows individual % complete entries for each task, with their high level activity roll-up automatically calculated. This is Nomenclature #1 Costed WBS description of 30% maximum for each activity in practice; it greatly minimizes subjective error in % complete assessment. This may seem a lot of manual entry work but in practice it is very efficient, it is the majority of work with the EVA spreadsheet during the entire project, only the discussions with team members doing the work may be time consuming. There will always be subjectivity to % complete assessment. However, with proportionally weighted broken down activities, consistent input from the team members doing the work, and with final assessment from the project manager’s overall view, good enough accuracy and reasonably objective % completes can be achieved over a project duration. 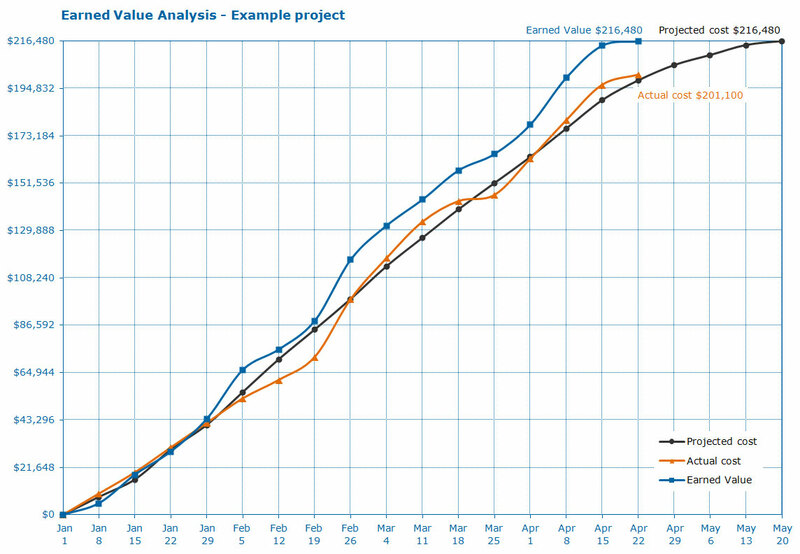 We are going to graph the matching timeline (top coloured bar) accumulative totals from Table 2 Projected cost, Table 3 Actual cost and Table 4 Earned value at an arbitrary mid-project cutoff date, and look at the entire project in time domain! Cost difference between Earned value and Projected cost, $17,468 under budget as the Actual cost is less than the value of work performed. Cost difference between Actual cost and Projected cost, $7,260 over budget. Cost difference between Earned value and Actual cost, $10,208 under budget. This is our EVA project status. 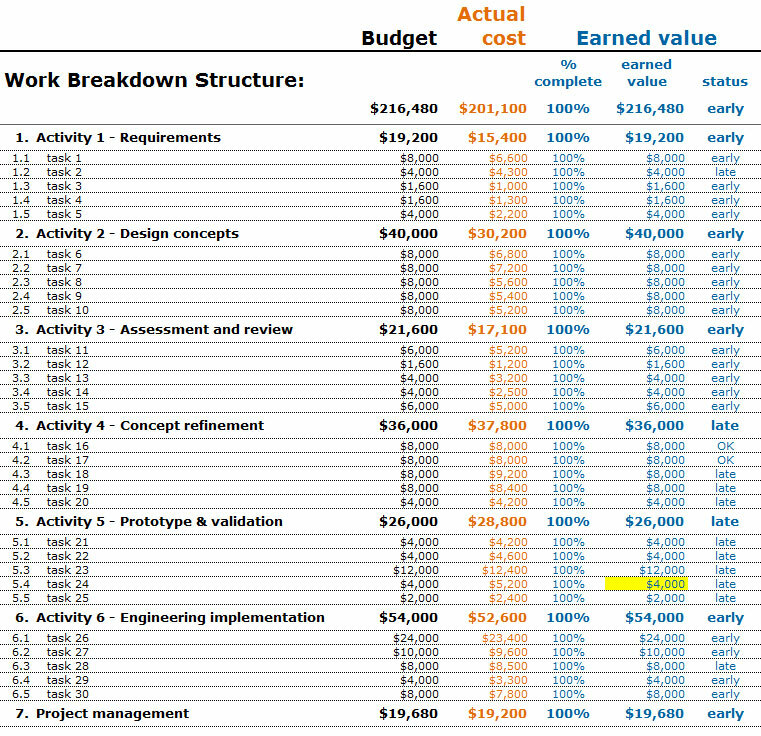 Schedule difference between Earned value and the Projected cost, a 1.5 week ahead or early finish situation. My project is 67% complete, $10,208 under budget, and showing a 1.5 week early finish. No other project management tracking tool can report project status like this that is real time, conclusive, math data supported, and so easy to understand. EVA does not require this visual display of quantitative information, Table 1 textual list is sufficient, but it is a very elegant one page project at a glance and does help as described below in section 6 Problem identification. All projects have problems including failure to identify and failure to understand their importance. EVA’s real time reporting can identify problem tasks as they occur and show potential effect to the activity and to the entire project. Table 6 highlight warns the project manager that item 5.3 task 23 Earned value is lower than its Actual cost by a predetermined %. The warning, the “late” flag, and 25% complete tell us this task will continue to accrue cost and time. Activity 5 roll up is also highlighted and flagged “late”, as are other tasks, an important early warning. The project manager can immediately decide what to do with Activity 5 and specifically item 5.3 task 23: budget problem, client or personnel issue, requires attention or maybe problem is already known. The most likely issue is normal variability of work tasks as this activity is clearly ongoing and the highlighted values are not excessive. This example warns a project currently in a good situation has a potential problem. It is almost guaranteed with traditional project tracking time based activity bar charts early problem identification is hidden, perhaps known only to the task owner who almost certainly isn’t going to inform the project manager in a timely manner and with full disclosure. For a design consultancy, a deeply buried problem like this example has potential issues: other team members waiting or client rejecting full invoice for activities finished so early when another task is late. EVA negates these situations, they simply can’t occur. Table 5 Earned value and Actual cost graphed lines show an over budget trend, occasionally a good sign when both rise together as it means a lot has been completed. 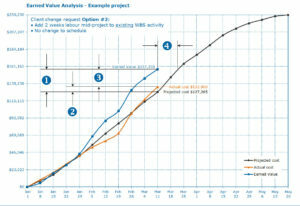 Ideally EVA graphed lines should match the Projected cost line or be slightly above as this implies an early finish. However, this Earned value line increased quickly and stayed up over 4 reporting periods: did we over estimate costs or did somebody do a lot of overtime? The project manager should watch this for a leveling off back to the Projected cost line. My project is 100% complete 4 weeks early and $15,380 under budget. The over budget trend discussed in section 6 Problem identification self corrected: we assigned extra designer to get work done fast, costs increased, then reduced to match the Projected cost line. Design consultancy projects occasionally experience post-completion work request. This example’s 4 week buffer and substantial budget float allow small follow on work commitment: excellent project management every client will appreciate. When the client requests changes it is easy to do live “what if…” exercises that immediately show changes to cost and schedule because EVA works in real time. This is effective project management, leading the client, not lose everything on unmanageable change requests. Add 2 weeks labour mid-project to new WBS activity without extending the schedule. Simulates the luxury of additional design staff. Minimal effect from before change request. Recommended. Add 2 weeks extra labour mid-project to existing WBS activity 100% complete tasks. Add new resource mid-project and extend the schedule 2 weeks. Small change to Earned value status and 2 week longer schedule, great if you can get it. 1. Not believing it when the data looks bad. Most problems are due to denial. EVA’s early problem identification is often explained as anomaly, anticipated, will be dealt with in succeeding weeks. A majority of these projects never recover, are delivered late or lose money. When EVA’s early problem identification is remedied, projects return to profitable performance on adjusted time and budget. 2. Not updating actual costs and % completes on a regular reporting period. Just being lazy, typically followed by playing catch-up later on and entering data all at once. Hides early problem identification, sometimes used as explanation for problem #1. 3. Incomplete WBS budget activities and mid-project updates. Moving dollar amounts immediately affects all earned value calculations, illustrated in Change request Option #2. 4. % Complete work status not discussed with team members. If only the project manager assesses work performance % completes then the EVA becomes his/her subjective, inaccurate report. 5. EVA used with other project tracking tools. The dollars in time paradigm and unlinking of tracking technical deliverables is a key to how EVA is a light weight tool with incredible data density control for projects of all sizes. Attempts to link back these two separated activities are a waste of time and never work well. Also, it is well understood that getting separate computer programs to interact is difficult, expensive, and frequently fails to succeed. Design consultancies earn revenue and profit from intellectual labour; EVA dollars in time paradigm tracks cost of work in time, an excellent tool to ensure you actually earn your expected profit. Unlinking tracking of project deliverables from cost and time to perform them increases objectivity and greatly reduces workload. The project at a glance visual display of quantitative information 3 line graph is easy to understand and is designed for one page output. Traditional time based activity bar dependent-milestone-deliverables model are terrible for this, often requiring reams of paper and sticky-tape or CAD roll-sheet plotters, and office walls to display entire project. Early problem identification as they occur is an excellent method to stop project problems before they become disastrous. Establishing a budget and projecting it over an entire timeline is majority of the work, and the latter is optional, a huge reduction in workload. Table 4 % Complete assessment per reporting period is the project manager’s total work required once the EVA spreadsheets are properly set up. EVA is lightweight, easy to learn, adaptable to projects of any size, and can track in real time from individual task to activity level and to entire project progress. It is hard to over emphasize design consultancies requirement to track revenue and profit. EVA is the best method to do this, live in real time, on any design project. EVA can be confusing when first introduced. Not tracking project deliverables is revolutionary for some people, but it’s evolutionary in how easy and successful it can be. EVA has been successfully used on a small $2,000 design research exercise to a large $2.2 billion nuclear power generating station retrofit EPCM project. All delivered on time, on budget, and earned their calculated profit. We are passionate EVA users, but we have repeatedly been asked to use client’s custom implementations of Microsoft Project, Primavera P3 and Suretrak, JDEdwards, SAP, MatrixONE, Enovia, and others. All use similar WBS personnel time based activity bars. All are spectacularly bad at visual display of quantitative information. They can all be made to work but demand significant specialist talent for ongoing professional maintenance. EVA has none of these weaknesses and is easy to use.